How has domestic life been reorganised to accommodate the new U.S. imperial ambitions? What are the consequences of empire for the people living here "at home"? This new collection of essays answers these questions by exploring the cultural, political, and economic shifts that are now under way in the United States. Encouraging a radical rethinking of what the country is today, this book highlights the connection of U.S. imperial strategies to the production of insecurity, uncertainty, and deepening inequality at home. 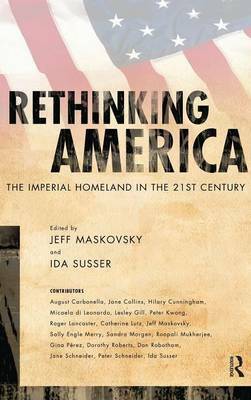 Rethinking America also explores the instabilities and contradictions of the new imperialism from the unique vantage point of the newly emerging U.S. "homeland." Comprised of work from leading figures in the field of U.S. ethnography, this book is essential reading for anyone interested in understanding the changes taking place in the United States in the early years of the twenty-first century. "This book helps us to understand a relatively neglected aspect of contemporary American imperialism: its antidemocratic impact on policies and institutions within the United States. This is engaged anthropology at its best-well-informed, compassionate, and intelligently argued. Important reading for our times." "Jeff Maskovsky and Ida Susser have brought together fine essays that explore the multifaceted interconnections between U.S. imperialist aggression abroad and our increasingly distorted domestic political economy. The imperial power has produced, they say, an imperial homeland, economically, politically, and culturally. We need to read this book."